Simsbury moved into the top position in The Courant area ratings after its 34-33 overtime victory over Glastonbury, the previous No. 1 team. Staples-Westport's14-10 victory over Bridgeport Central in the FCIAC championship put the Wreckers atop The Courant state ratings over Glastonbury. 1. STAPLES (10-0): Rallied to defeat Bridgeport Central in FCIAC championship. LW: 2. TW: Greenwich Thursday. 2. 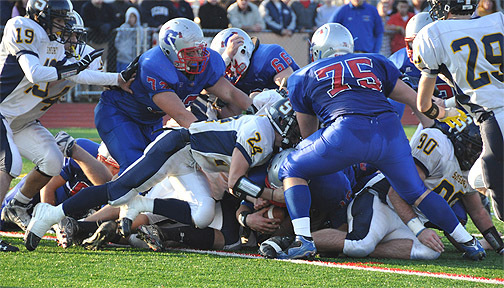 POMPERAUG (10-0): Recorded impressive 38-23 win over Masuk in SWC title game. LW: 4. TW: at Oxford Wednesday. 3. NEW LONDON (9-0): Whalers routed Sheehan 40-7 to stay atop Class M. LW: 5. TW: at Norwich Free Academy Thursday. 4. SIMSBURY (9-1): Made big vault after it ran for 365 yards to beat Glastonbury. LW: Not rated. TW: idle. 5. XAVIER (8-1): Prepping for the Class LL playoffs. LW: 6. TW: Middletown at Wesleyan's Andrus Field Thursday. 6. BLOOMFIELD (9-0): The No. 1 S team is preparing for its neighborhood scrap with Windsor. LW: 7. TW: Windsor Wednesday. 7. GLASTONBURY (9-1): Had its 22-game winning streak stopped by Simsbury. LW: 1. TW: idle. 8. MASUK (9-1): Despite Casey Cochran passing for over 500 yards, the Panthers lost to Pomperaug. LW: 3. TW: Newtown Wednesday. 9. NOTRE DAME-WEST HAVEN (8-1): Getting ready for annual Thanksgiving Day test with Hamden. LW: 8. TW: at Hamden Thursday. 10. CONARD (10-0): Rolled over West Hartford rival Hall, 42-7. LW: not rated. TW: idle. 4. GLASTONBURY (9-1): LW: 1. 6. AVON (10-0): Completed undefeated regular season with 47-20 win over Canton. LW: 5. TW: idle. 7. BERLIN (8-1): First contest with New Britain and a M semifinal await. LW: 7. TW: at New Britain Wednesday. 8. CHESHIRE (8-1): Stayed in LL playoff race with a 27-12 victory at West Haven. LW: 9. TW: Southington Thursday. 9. NORTHWEST CATHOLIC (8-1): Ends regular season against Plainville and then plays in S semifinal. LW: 8. TW: at Plainville Thursday. 10. VINAL TECH/COGINCHAUG (9-0): LW: 10. TW: Cromwell at Palmer Field-Middletown Wednesday. Ratings compiled by high school football writer Tom Yantz in consultation with area coaches and The Courant staff. GLASTONBURY, Nov. 14 – Simsbury’s defense made the play of its season Saturday, stopping a two-point conversion run in overtime to stun defending Class LL champion Glastonbury, 34-33 and win a share of the CCC Division I championship. The host Tomahawks scored two touchdowns in the final six minutes and had a chance to win with 47 seconds left but missed an extra point (wide right) to send the game into overtime tied at 27-27. Simsbury scored first in OT when Kevin Kucinskas scored on a fourth down run from the one and James Poggio added the extra point for a 34-27 lead. The Tomahawks answered on Sean McQuillian’s 1-yard run but Glastonbury went for the win, with McQuillian trying to run in a two-point conversion. Simsbury stopped him just inches shy of the goal line for the thrilling victory. Simsbury finishes the regular season 9-1 and 6-1 in the CCC Division I with a share of its first championship since 1994. Glastonbury (9-1, 6-1) had a 22-game winning streak snapped. McQuillan scored four TDs. Simsbury remains alive for a berth in the CIAC Class L tournament for the second straight year. Glastonbury took the early lead but after a fumble, the Trojans marched 75 yards with Kucinskas scoring from the two. McQuillan’s 1-yard TD run with 26 seconds left in the quarter gave Glastonbury a 14-7 lead at halftime. In the second half, Simsbury took a 27-14 lead after three unanswered TDs. Conely Cummings scored on a 1-yard run, Poggio pulled in a 33-yard pass from Kyle Decker and Decker scampered in from 10 yards out with 6:04 left in the game. But after Decker’s TD, Poggio’s extra point attempt was blocked leaving the lead at 13. Glastonbury cut the lead to six when Ryan McCarthy pulled in a six-yard pass from McQuillian with 3:32 remaining. Simsbury got the ball back but Glastonbury made a big stop on fourth-and-1 at the Trojan 45-yard line with 1:27 left in the game. Josh Gowdy, Seb Ozyp, Mike Mormile and James Poggio on final play of the game stop the Glastonbury quarterback as he tries for the touchdown. In a heart pounding classic game, the Simsbury Trojans defeated the Glastonbury Tomahawks 34-33 in Glastonbury Saturday in overtime. By most accords, this was the most exciting and well played game in recent high school football history. SGC would like to thank all of the fans that traveled to Glastonbury to cheer for the Trojans. The crowd was estimated to be at over 2,000 people, standing room only. At least half of these fans were cheering for the Trojans! GLASTONBURY - Simsbury outlasted Glastonbury 34-33 in overtime Saturday at Stadium Field. Kevin Kucinskas opened the scoring with a 1-yard run on fourth down. James Poggio added the conversion kick. Sean McQuillan scored for Glastonbury on a 1-yard run to make the score 34-33. But he was stopped short on his attempted conversion run to win the game. The win likely puts Simsbury (9-1) in the Class L playoffs, while Glastonbury's 22-game winning streak ended. The Tomahawks (9-1) will have to wait to see what other teams do this week to see if they can make the LL tournament. From The Hartford Courant Online. Kyle Decker named to Fab 15! •ConnorButkiewicz, Southington: Threw for 257 yards and five touchdowns, as the Blue Knights defeated Newington, 32-21. •Bryant Davis, Rockville: Rushed for 159 yards and two scores to power the Rams over Plainville, 43-0. •Kyle Decker, Simsbury: Ran for 175 yards and passed for 81 in 40-19 triumph over Hall. •Max DeLorenzo, Berlin: Had TD runs of 8, 4, 32 and 29 yards and finished with 178 rushing in 38-14 CCC Division III-clinching title win over Platt. •Jonathan Esposito, Conard: Carried the ball 34 times for 204 yards as the Chieftains beat East Hartford, 41-20. •Jimmy Fairfield-Sonn, Valley Regional: Had four receptions for 131 yards and two scores in 38-0 victory over North Branford. •Eric Male, East Catholic: Recorded three scores and ran for 225 yards, as the Eagles downed Maloney, 35-21. •Ross McDonald, Avon: Averaged 20.7 yards a carry (13-269), as Falcons routed Enfield, 51-12. •HenryMeneses, Prince Tech: Had 177 rushing yards and three TDs in a 34-16 win over Sport Sciences-Hartford. •Ryan Monteiro, Cheney Tech: Finished with 116 rushing yards and two TDs on five carries, had a conversion run and returned five kickoffs for 137 yards in 52-16 win against Abbott Tech. •C.J. Morrison, Capital Prep/Classical: Recorded 162 yards on the ground and one TD as the Trailblazers beat Putnam, 28-20. •Ryan Murphy, Xavier: Caught five passes for 143 yards, including TDs of 39 and 35 yards, to help the Falcons handle Fairfield Prep, 35-7. •Matt Patrick, RHAM: Ran 5 yards for the winning TD on the last play to lift the Sachems over E.O. Smith-Storrs, 15-14. •Jeremy Rodriguez, Newington: Ran for 162 yards on 14 carries and two TDs in a 32-21 loss to Southington. •Nate Tembi, Ellington/Somers: Finished with 253 rushing yards and three TDs in 28-6 win over Housatonic/Wamogo. or click on the Collinsville Press link to the left. SGC would like to thank the Collinsville Press for it's excellent coverage of area football games. SIMSBURY, Nov. 6 – The game had long been decided and there was under a minute left. Hall was driving on Simsbury and had the ball on the Trojan 19-yard line with about 20 seconds left. It was no time to exhale. For defensive coordinator Peter Bourquin, this was another teachable moment. Defensive back Josh Gowdy batted away a pass on first down. And pressure from Simsbury’s front four including Bill Amarante and Michael Mormile forced a pair of incomplete passes from Hall QB Riley Carroll to end the game. Simsbury’s Kyle Decker ran for a career-high 181 yards and two touchdowns on 20 carries to lead the Trojans to a 40-19 victory over Hall on a chilly Senior Night in the regular season finale at the high school. Kevin Kucinskas ran for 98 yards and a touchdown while James Poggio pulled in a 40-yard TD pass from Decker. The win keeps Simsbury (7-1, 5-1 CCC Division I) in the hunt for a Class L playoff berth but it also keeps alive Simsbury’s hopes for its first conference championship since 1994. Simsbury travels to Farmington on Friday night but they play for a piece of the CCC Division I title when they tangle with Glastonbury (8-0, 6-0) on Saturday, Nov. 21 on the road. It wasn’t the prettiest win for the Trojans but style points don’t count in high school football. Carroll completed 25 of 51 passes for 264 yards, 2 TD passes and one interception. Most were quick, short passes but he did complete some nice passes down the middle of the field. Teammate Jake Rosario rushed for 122 yards on 21 carries. The problem was that Hall (1-7, 1-6) couldn’t keep up with Simsbury, which scored three touchdowns in the second quarter to take a 26-13 halftime lead. Simsbury opened the third quarter with a 69-yard scoring drive with a wide open James Poggio collecting a 40-yard TD pass from Decker to open a 33-13 lead. Hall lost two yards on its first drive and punted. On its next drive, the Warriors had a 10-play drive early in the third quarter but that ended with an interception by Simsbury’s Josh Helmkamp. With its no huddle offense and Carroll completing 7 of his first 11 passes for 41 yards, Hall ate up four minutes on an 11-play, 55-yard drive to take a 7-0 lead. Carroll found Edgar Hannibal open on a 10-yard scoring strike. It took Simsbury 59 seconds to respond thanks to a 67-yard run down the sideline from Decker. Kevin Kucinskas scored from the seven. Poggio’s extra point try bounced off the right upright for a 7-6 Hall lead. Hall ate up the final four minutes of the first half and extended its lead to 10-6 on Steinberg’s 32-yard field goal. Again, Simsbury struck quickly, scoring in about 2:22 on Colby Vanderbeck’s five-yard run to take a 12-10 lead. Decker’s 41-yard pass to Poggio down the middle of the field was the big play. The two-point conversion failed. Hall drove to the Simsbury 34 before its drive stalled. Simsbury took over and marched 66 yards in less than a minute in a half with Decker scoring from the one for a 19-10 lead with 6:02 left in the second quarter. Connely Cummings had a 37 yard run and Kucinskas added a 23-yard run of his own. It took Simsbury a little longer to score on its next drive, about 2:30 when Decker scored from the two with 1:59 left in the half for a 26-10 lead. The big plays were consecutive big runs from Decker (17 yards) and Kucinskas (29 yards) to get the ball to the Hall 11. Simsbury showed persistence early in the fourth quarter. A 27-yard run by Vanderbeck and a 13-yard run from Kucinskas gave Simsbury first-and-goal from the Hall 3. But three consecutive penalties pushed the ball back out to the Hall 25. Josh Helmkamp scored on a nice reverse with some good blocking to extend the lead to 40-13. The Trojans bounced back after their tough first loss last weekend to beat Southington 29-26. The great team effort resulted in Simsbury's first win in Southington ever. Conley Cummings rushed for 127 yards and three touchdown to lead Simsbury to a 29-26 CCC Division I win at Southington Friday night. Kyle Decker ran for an additional 137 yards and a score for Simsbury (6-1), which scored all of its points in the first half in taking a nine-point lead. Connor Butkiewicz completed 25 of 39 passes for 306 yards and four touchdowns for Southington (4-3). SOUTHINGTON, Oct. 30 – It was appropriate that the Simsbury High football team pulled another skeleton from their closet the day before Halloween. Two years ago, Simsbury ended an 11-year winless streak against Bloomfield. A year ago, the Trojans earned their first win ever against New Britain. On Friday night, Simsbury overcame two early turnovers and two first quarter scores by Southington to put up 22 points in the second quarter and beat the Blue Knights for the time since 1971 with a 29-26 victory that wasn’t decided until the final play. Southington (4-3, 3-3 CCC Div. 1) played with a sense of desperation knowing that a loss would eliminate the Knights from serious CIAC playoff contention. A week after allowing New Britain quarterback Rafal Garcarz to carve up the Trojan secondary by completing 19 of 26 passes for 244 yards and two touchdown passes, Southington QB Connor Butkiewicz completed seven of his first eight passes for 147 yards and 2 TDs, including a 73-yard TD pass to Anthony Florian that gave Southington a 12-7 first quarter lead. But the Trojans didn’t panic. They changed their coverage in the secondary and began to apply more pressure on Butkiewicz. Simsbury rarely got a hand on him but Butkiewicz began finding fewer receivers open. And the Simsbury offense gave its defense time to regroup. After Florian’s 73-yard bomb, Simsbury marched 32 yards into Southington territory. The drive stalled but punter James Poggio had a nice, high punt that was nearly downed inside the five-yard line. Southington was penalized for holding on the return and took over its own one. On the next play, Simsbury’s Michael Mormile tackled Dylan Danko in end zone for a safety to cut the lead to three, 12-9. On its next possession the Trojans marched 48 yards on eight plays with QB Kyle Decker scoring from the nine for a 16-12 lead. Simsbury held Southington to five yards on its next possession, forcing a punt. The snap to Southington punter Nick Gothberg was too low. He tried to run but he was tackled for a 13-yard loss. Simsbury took over on the Southington 25 and two plays later, Cummings ran through a big hole and made it untouched on a 23-yard TD run for a 23-12 lead. Southington responded with a 24-yard TD pass from Butkiewicz to Michael Rhodd with 1:57 left in the half to cut the lead to three, 23-20. But Simsbury received a 40-yard kickoff return from Vanderbeck and marched 52 yards in less than a minute, scoring on a 4-yard run from Cummings with 54 seconds remaining to take a 29-20 lead. It was the third touchdown of the game from Cummings (21-105). In the second half, the Simsbury defense bent but did not break. They batted down four passes and received a key interception from Kevin Kuchinskas that stopped a Southington drive to the Simsbury 10-yard line. Southington cut the lead to three, 29-26, with a third quarter touchdown and was driving to take the lead late in the third quarter. They had first and goal from the 10 but Simsbury’s Andrew O’Connor made a TD-saving tackle on first down, Daniel Hewitt made a big stop on second down for a six-yard loss and Mormile and Poggio batted down passes on third and fourth down, respectively, to end the drive. With 6:48 left in the game and Simsbury still holding a 29-26 lead, the Knights drove to the Simsbury 10. On fourth down and three, Kuchinskas stepped in front of the receiver for the interception to end the drive. Simsbury’s offense ate up nearly six minutes marching to the Southington nine before being stopped. The Knights got the ball back with 50 seconds left but ran out of time. Simsbury hosts Hall in its home finale on Friday before concluding the regular season at Farmington on Friday, Nov. 13 and a challenging Div. 1 finale at Glastonbury on Nov. 21. NOTES: The two teams combined for four turnovers on the first four possesions of the game. Both team fumbled the ball away twice. Simsbury coughed up one ball at the one, just before Decker crossed into the end zone for an apparent touchdown. ... Billy Felice and Kuchinskas each recovered fumbles. ... Kuchinskas gained 21 yards after intercepting the ball in the fourth quarter. ... Simsbury had lost seven straight to Southington since its last win in 1971, 27-20. The two teams resumed their series in 2004 when the CCC established the CCC North. The series between the two schools dates back to 1920. Behind a strong team effort, the Trojans defeated an excellent Berlin squad Friday night to remain unbeaten. For detailed coverage, please see below. Thanks to Mike Cupo for access to these shots. From the Hartford Courant. Click Here For Full Coverage. SIMSBURY - — Simsbury quarterback Kyle Decker didn't complete either of his two passes Friday night, but it didn't matter. That was because he ran the veer so well. The Trojans ran for 283 yards on 46 carries and four touchdowns in a 28-14 victory over Berlin at Stadium Field. Decker had 88 yards on 19 carries and two touchdowns and fullback Connely Cummings finished with 99 on 13 tries and two TDs. Decker adroitly handed off, or faked handoffs and ran for Simsbury (5-0), No. 2 in The Courant's area ratings. And No. 4 Berlin (4-1) couldn't stop the Trojans. "Simsbury is good, big and strong, and they pushed us around," Berlin coach John Capodice said. Berlin was impressive early, going 68 yards for a TD on the game's first drive. Max DeLorenzo ran for 28 yards and Dan Hackett completed two passes for 26 yards. Hackett's 3-yard run put Berlin on top, 7-0. When a fumbled handoff was picked up by Berlin's AJ Marsiglia at the Simsbury 37 with 5:15 to go in the first quarter, it looked like the Redcoats were going to increase their lead. But the drive stalled at the 5 when Berlin failed to convert a fourth-and-4. Simsbury was just about unstoppable the rest of the game. Berlin couldn't stop Decker, Cummings, Kevin Kucinskas (54 rushing yards) or Colby Vanderbeck (37). A 5-yard run by Cummings tied the score 7-7 early in the second quarter. Decker continued to gain yards — he had 57 in the first half — and led the Trojans down the field again. His 3-yard scamper off right tackle made the score 13-7. Berlin bogged down, as DeLorenzo, who entered the game averaging 200.5 yards, had just 18 after the first drive in the first half. "After the first series, I was proud of the kids coming back," Simsbury coach Jeff Osborne said. There was no letup after the second-half kickoff. Simsbury needed just two runs — the last 31 yards by Cummings — to score its third TD. Decker's conversion run made it 21-7. "That showed we could beat them and were going to beat them," Cummings said. Decker scored from a yard out in the fourth quarter. Berlin's Hackett was 10 of 16 for 115 yards and DeLorenzo ended up with 81 rushing yards, including a 17-yard TD run late in the game. But they were no match for the Simsbury veer. "I think the veer was designed for me," Decker said. "The running, the ball fakes. It works for me. It works for us." Helmkamp Named to Hartford Courant Fab 15! With another terrific team effort the Simsbury Trojans Varsity squad defeated Middletown 45-14 on Saturday afternoon. The SHS boys rode a shut down defense and balance offensive attack to a 38-0 halftime lead. Special teams were also excellent as the Trojans moved to 4-0 on the year. The Trojans will face their toughest opponent yet this year on Friday night in their game versus Berlin, a team that is also 4-0. The freshman also won versus Middletown, while the JV were narrowly defeated in overtime. MIDDLETOWN - Kyle Decker ran for 105 yards and three touchdowns and Josh Helmkamp returned a fumble 65 yards for a score and also had a 30-yard interception return as Simsbury defeated Middletown 45-14 Saturday in CCC Division I.
Conley Cummings rushed for 85 yards, including a 7-yard TD run, and Colby Vanderbeck ran 30 yards for a TD as Simsbury (4-0) remained unbeaten. Middletown is 0-4. Simsbury led 20-0 in the first quarter and 38-0 at the half. Behind a strong offensive and defensive showing, the Simsbury High School Varsity defeated East Hartford on homecoming weekend 41-7. The JV and Freshman also were victorious, leading to a weekend sweep for Simsbury. For pictures from the Simsbury Varsity versus East Hartford game, please click below. Thank you to Mike Cupo for taking these pictures and sharing them with us. Kyle Decker rushed for 104 yards and a touchdown and threw a 6-yard touchdown pass to Mike Mormille as Simsbury defeated visiting Windsor 30-19 Thursday in a CCC Division I game. It was the first game at Windsor for coach Rob Fleeting, who led Weaver to five playoff appearances in 10 seasons. Windsor led 7-6 at the start of the second quarter before Simsbury scored 23 straight points, including a 3-yard run by Kevin Kucinskas (80 yards on nine carries). Windsor's Pierre Narcisse was 16-for-36 passing for 136 yards and one TD.